Building a menu is a lot like matching patterns. Jenny Komenda, of Little Green Notebook, has this formula: “one big pattern, one small, one stripe, one geometric, one floral/organic, plus or minus one animal print.” My formula for menus: one fruit, one vegetable, one protein, one grain, something spicy, something sweet, plus or minus a meat. 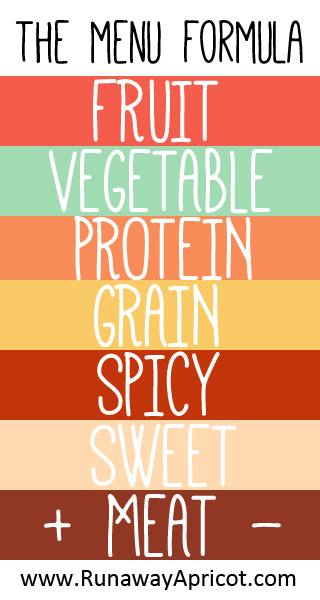 A meal should be complex in color, texture, temperature, taste and nutrients. Sure, those elements will overlap in a few dishes, but by keeping it all diverse, there’s less worry about clashing flavors or boring redundancy. Add a focus on seasonal ingredients, and everything is sure to be harmonious. The menu for my most recent brunch was all of that and more; if less is more. It was pretty easy to put together. 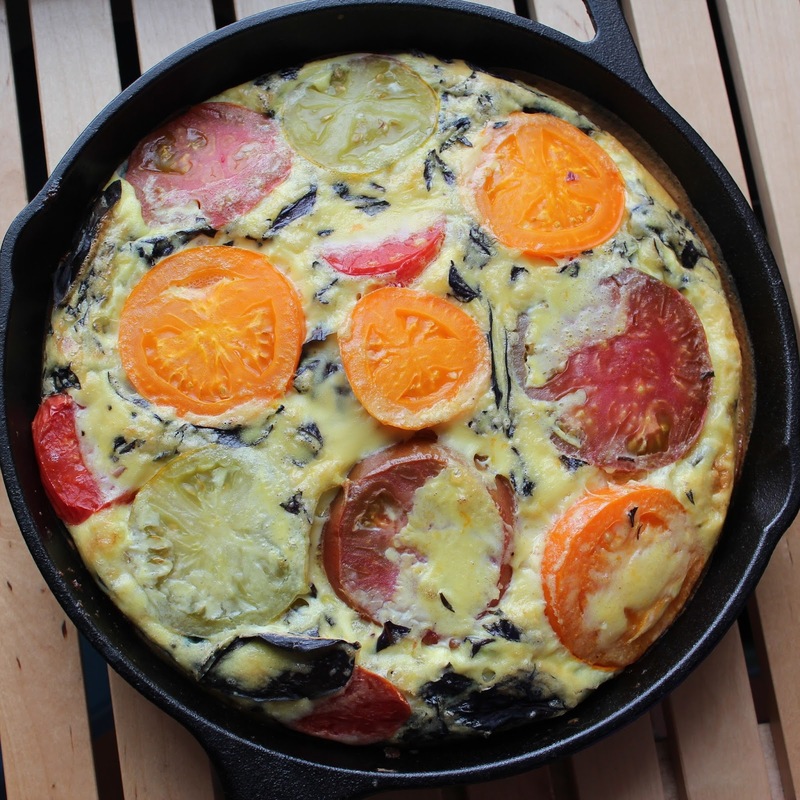 Instead of my usual weeks-long hunt for recipes, I took a quick spin through my food-entertaining board on Pinterest and got the inspiration for my Heirloom Tomato Frittata. The protein was covered, but I love breakfast meat with my eggs so a spicy sausage like chorizo came next. Toast followed naturally – something to sop up the dribble of chili oil from the meat. 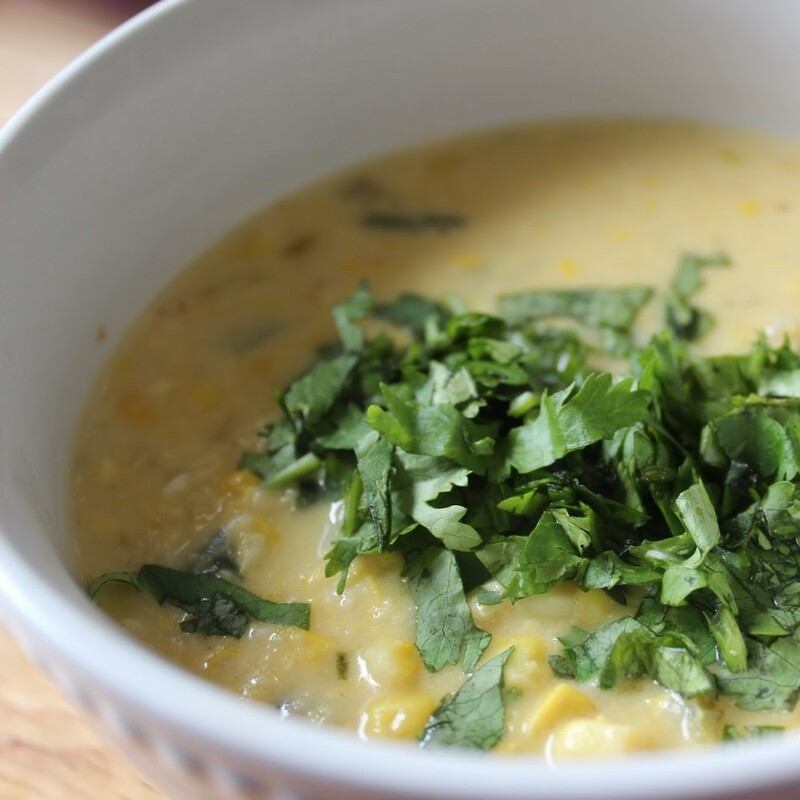 Then, after last September’s dinner party, I was due for making the corn chowder again. 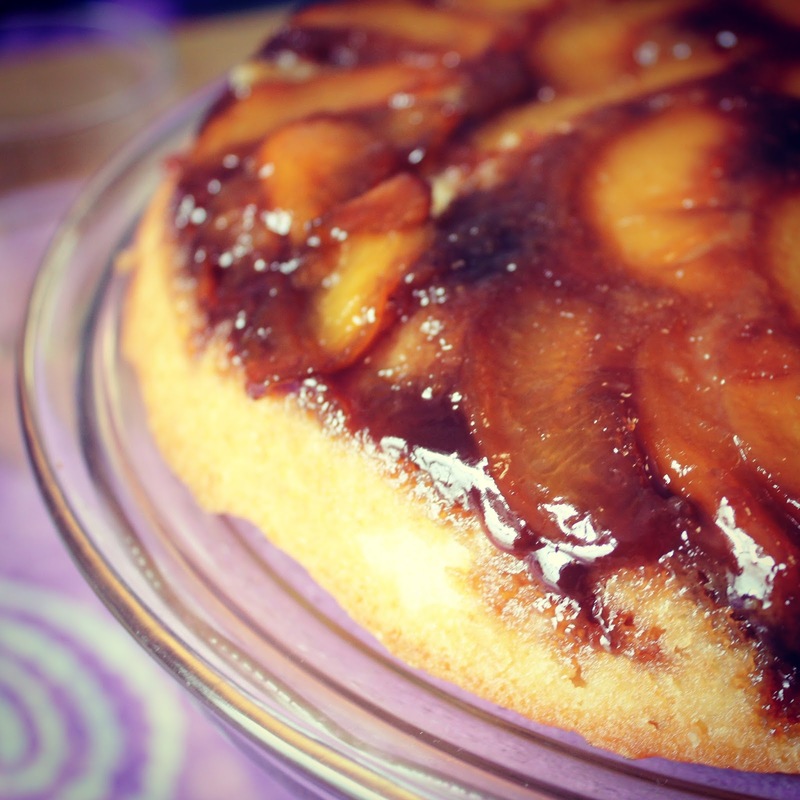 The peach upside down cake was a novel, canless remake of the fluffy and syrupy pineapple upside-down cake I had baked often as a child. Watermelon was the fluffer – something I could have ready and waiting for guests if they broke the rule of home entertaining and arrived on time. I have accepted the fact that I am always late, so now I plan for it. The purple tie-dyed linens were my grandmother’s – she and I shared a favorite color. I folded the tablecloth to make a runner and expose some of the table’s wood. The plates and flatware were simply white and silver. I wanted to find nice flowers for a centerpiece, but my market did not have any gentle blooms so I used the pop of the watermelon’s bright pink flesh as edible art. My ‘Make You Mine’ playlist with funky beats from the 1970’s ’til today. I always listen to this playlist on shuffle, blending the different albums and eras. It’s all upbeat, happpy, safe for work, and the obscurity of many of the tracks makes for a pleasantly obtrusive conversation piece. So that was it. A very small gathering friends for some yummy, seasonal foods.